You have too much on your plate. If you feel your workload growing out of control and you can tell the quality of your work is sharply declining, it’s time to say no. How to do it? The next time your project leader tries to assign you something new, do not immediately say yes. Arrange to meet one-on-one (it is much easier to reason with someone one-on-one than in a group) and lay out your reasons for not wanting to take on the project. This is a tough one, but ultimately, if you are constantly handed work that does not align with your areas of expertise, you are doing both your company and yourself a disservice. Your company won’t receive the best work it could receive and you’ll be straying from your career goals. So, how to say no? Again, a one-on-one meeting with your supervisor is helpful in this situation. Explain to her what your ultimate goals are and what kind of projects you prefer. One of the best things you can do in this situation is approach it with confidence and decisiveness. Know where you’d like to be heading and explain, confidently, how you’d like to get there. Ultimately, if your company is not supportive of your career goals (or if you find that the type of work you do constantly does not align with your sweet spot), it is time to start searching for something new, either inside or outside your current company. 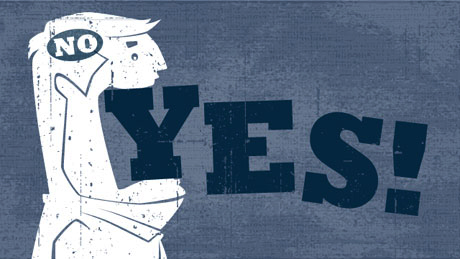 Saying yes compromises your values.